This evening I attended the Silicon Valley IGDA Meeting, held at Electronic Arts’ main campus in Redwood Shores, California. 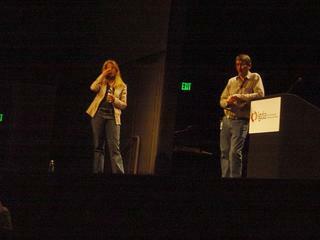 Speaking tonight were Will Wright, inventor of The Sims, and Lucy Bradshaw, exec producer of The Sims 2. They were typically brilliant and amusing, with Will’s characteristically peculiar Powerpoint slides, and Lucy’s array of demos and outtakes for The Sims 2. I found it most interesting to hear about how they’re encouraging fans and fansites to take part in The Sims’ universe, especially going forward into version 2. They have a very strong method of working with the fans to engage them ever more deeply, and ensure that the fans feel that they’re a shareholder, not just a player. Quite impressive thinking.